The truth is that while there are many grand developments in our future, some are more nebulous than others. For example, the proposed Union Station expansion and LA River revitalization seem promising, but are stages away from having a shovel in the ground (how’s Farmer’s Field coming along?). Fortunately, there are many tangible developments going forward that will impact our city’s future. Here are the most significant projects on their way that you should keep your radar on. The Sixth Street Viaduct has served as an important link between the Arts District and Boyle Heights since it’s construction in 1932. Studies in 2004 deemed the bridge nearing an unsafe level due to it’s disintegrating concrete supports. A plan was hatched for its replacement putting forth a prestigious design competition drawing entries from many of the world’s top firms. 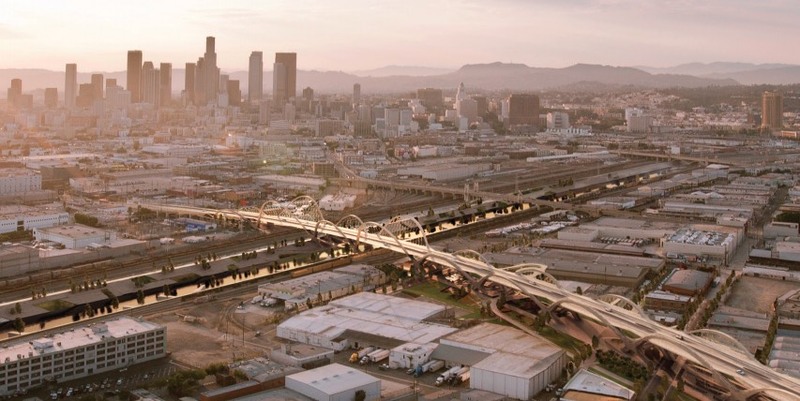 Architectural big wig HTNB won with it’s impressive design featuring a flowing series of slanted arches strewn across the LA River. There will also be a pedestrian, bicycle and park space elements incorporated into the bridge. It’s such an elegant design that it may be the defining LA landmark of the 21st century. The Strip has seen better days, but developers in West Hollywood are doubling down that the new Sunset La Cienega project will bring back some life. The first phase will open on the west side of La Cienega with two ten-story boutique hotels in the ilk of the Standard or the Mondrian. This sounds like a natural fit, but its hard to imagine that this first major hotel to be built on the Strip in over 30 years. On the other side of La Cienega, another two buildings will house 190 residential units and a large swath of retail space. The complex will have plenty of amenities, but thinking about the traffic already makes we wonder if it’ll be worth it. One building that will soon be impossible to miss is the new Wilshire Grand, opening in 2017. When completed, this skyscraper will reach 1,100 feet, supplanting the US Bank Tower as the tallest in Los Angeles by 80 feet. 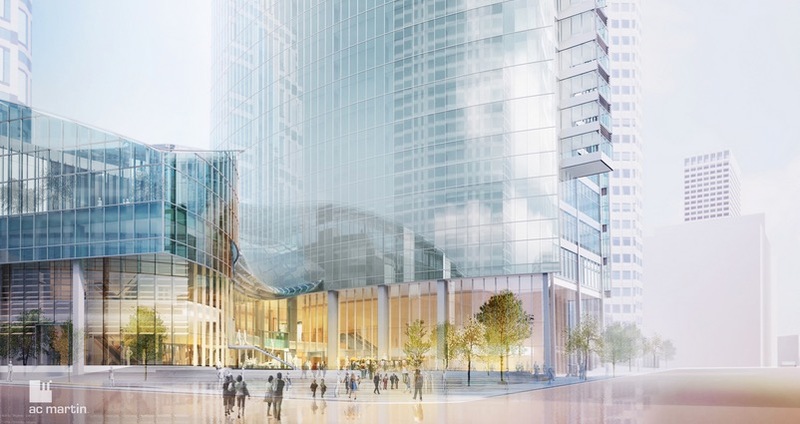 The building will carry a mixture of around 900 hotel, rental and office units. While it’s sweeping roof will be come an instant landmark, the building is already famous for owning the Guinness World Record for the largest continuous concrete pour ever. Prepare to do some rubber-necking when you approach downtown. It’s been a long time coming, but the subway is finally headed where it was originally intended to go. The line was supposed to head west down Wilshire and then north up Fairfax into Hollywood, then the Valley, but faced a lot of pushback from the NIMBYs of Hancock Park. When a methane explosion hit the Fairfax District in 1985, congressman Henry Waxman led a legislative measure banning any subway expansion through this zone. Waxman overturned the ban in 2005 and now construction is moving forward. The Purple Line should open to La Cienega in 2023 with the hope of reaching Westwood in 2030. Of course, Beverly Hills is pressing opposition to some of the path, so maybe they should hire Waxman as a consultant. Let’s face it. It was a struggle for you to lean your eyes beneath something referencing the San Fernando Valley. For sure! The Village at Westfield Topanga aims to be an outdoor urban center instead of just another valley shopping mall. You know, like the other ones that bookend the site. Totally. Westfield is plugging over $350 million to build this 550,000 square foot development featuring a ton of retail and restaurants laid out in a pedestrian manner. I don’t know how the Costco is fits into this scheme, but I imagine that’ll attract more cars than walkers. For sure. Needless to say, this vehemoth will either sink or swim or kill off its neighboring malls. OMG. The transformation of LAX has already begun, but as you’d expect with any major airport, it is done in long phases. With the Bradley International Terminal expansion recently finished and updates to the other terminals in various stages, LAX will finally have a modern feel both inside and out. The biggest feature that will radically change how it functions is the upcoming people mover that will connect the airport to the future Crenshaw Line stop on Aviation and 96th. Along the way, it’ll also link up to a Rental Car Center as well as new pick up and drop off zones. It took a lot of work by many government agencies, but I credit the Department of It’s About Time for getting this started. As already evidenced, there are so many significant projects going up in downtown that it’s hard to stand out amongst them (hopefully you’re listening Grand Avenue). The Metropolis development is one that has been lingering for awhile and is now making quite a statement as it is finally going forward. Rising on the east side of the 110 between 8th & 9th street, construction is well underway for phase one featuring a 38 stories of condos and 19 story hotel. Phase two has also started bringing another 500 condos to a 40 story tower. The last phase has yet to begin, but when completed will be the tallest residential building in LA and form the biggest mixed-use complex on the west coast. Oh, and it’s already over 40% sold, so this one is getting built. There’s a lot of transportation mentioned here, but why not? This has been the greatest period of rail growth since the Huntingtons ruled the land. Phase two of Expo Rail is soon coming and should continue over performing on those ridership projection, just as phase one did. Our first real connection to the beach in about a lifetime, Santa Monica will now be accessible directly from downtown providing a great alternative to the 10 freeway. On the other end of the line, the regional connector has broken ground allowing both the Expo and Blue Lines to continue through downtown saving you that scary transfer at the 7th Street Metro Station. And yes, you can bring a surfboard on the train.